Any restaurant where you can say the words ‘Thai’ and ‘barbecue’ in the same breath gets my vote. 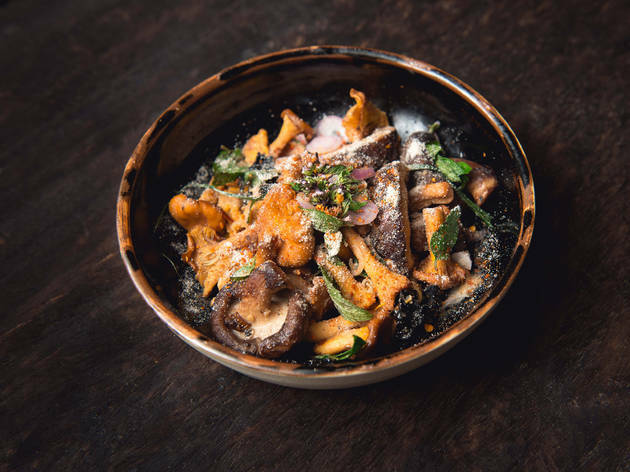 Kiln is the latest gaff from self-taught chef Ben Chapman – of Smoking Goat fame – and aims to take its by-the-roadside cooking style to the next level. And yup, his Thai barbecue game is pretty strong. Smoking Goat has more of a dive bar vibe, with a handful of dishes and the kitchen out of sight. At Kiln, the ground floor is all about two things: cooking or eating. A stainless-steel counter runs its full length. Behind it runs the equally long open kitchen. There’s action and cheffery and drama at every swivel of your stool. Sit at the back for the pyromaniac seats: a view into the kiln itself. Inside this small, insulated furnace, chestnut and oak logs are sent to their fiery end, the glowing embers occasionally removed to ‘feed the grill’ (as in, the chargrill) or ‘feed the tao’. 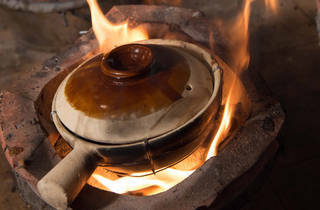 A tao, in case you’re wondering, is a round ceramic container: you keep adding embers until there’s enough heat to cook on, using either a wok or a clay pot. Want to turn the heat down? Simple: take out an ember. It’s brilliantly low-tech. The food is similarly stripped back. 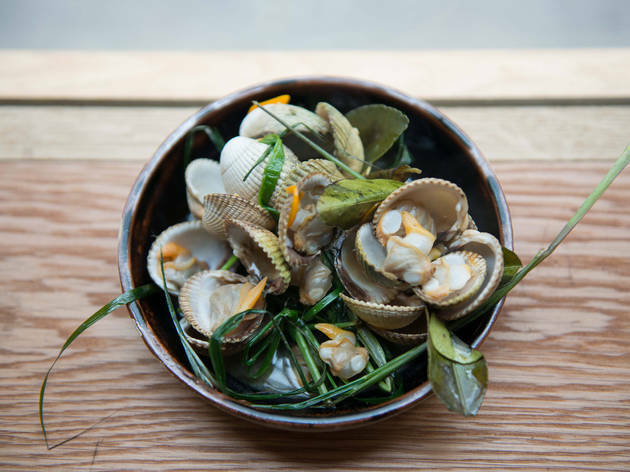 Dishes may be inspired by rural Thailand, but, where possible, they’re made with world-class British produce, mostly from indie Cornish suppliers. The lemongrass and Szechuan pepper, for instance, comes from a coastal polytunnel (a project Chapman helped fund). The pork loin – cut from rare breed, fully free-range pigs – showcases Kiln’s ethos perfectly. A slab of succulent, ember-charred meat arrives sliced, with a zingy, fiery, sweet and salt sauce (of fresh lime juice, fish sauce, dried chilli and palm sugar) for dipping. Even better is the mackerel curry: a dry-fried explosion of flavour under an obscenely fresh piece of fish. (If you think of mackerel as ‘fishy’, Kiln is the place to convert you – all the fish has been out of the ocean for less than eight hours.) Or the wild ginger and short-rib curry, bursting with fragrant Burmese spices and pieces of beef so tender, you could eat them with a spoon. The dishes rarely use coconut milk (have you tried growing coconuts in the UK? ), so go ahead and order several portions of the deliciously chewy brown rice: not only is this an excellent way to balance out all those intense, edgy flavours, but it’ll make your meal – and of course your moolah – go a lot further, too. Not everything was perfect: a pair of cumin and chilli skewers would, paradoxically, have worked better with cheaper, fattier pieces of lamb (like the way they’re done at Silk Road in Camberwell) and an otherwise interesting dish of clay pot-baked glass noodles with pork tenderloin and crab meat was marred by being a touch overcooked. But these are minor quibbles in what is fundamentally a good-value place to eat exciting food. Downstairs – where the groups sit – is a different kind of fun. It’s dark, it’s loud, it’s the place to bring your very best mates. The thing to do, apparently, is to ring up in advance, ask when the suckling pig will be in, then book yourself a basement table. That sounds like my kind of dinner party. Mon-Sat 12.30pm-2.30pm, 5-10.30pm; Sun 1-8pm. My wife took me to Kiln last night to celebrate my 50th. We knew we couldn't book in advance, so turned up at around 6.30. We were told a table would be ready at around 7.35, and were sent a text message with a link we could check telling us how long we'd be waiting. We headed off round the corner for a drink and at 7.30 the link was still saying 19-29 minutes, but we then got a text message saying the table was ready and would only be held for ten minutes. We gulped down our drinks and headed back. When we got there, we were told the people in our space were just paying. We then realised there were several other couples also standing around waiting. We were left standing there for thirty more minutes. No explanation, no apologies, no nothing. In the end, I decided that no food is good enough to tolerate this appalling level of customer service and left, after letting the manager know what I thought of the system. Ultimately, the way a place treats its customers is a sign of its values. This place treats customers complacently, as cash cows and with no care or respect. After having so many people reccommend Kiln we finally gave in to the hype and went along on a Saturday. We arrived around 6pm and were told around 45 minutes wait. No worries, as luckily the excellent Sam Smiths pub Glasshouse Stores is across the way, so we could happily wait with a pint. Once in, the incredibly friendly staff popped us on the counter right near the smoke (the best place in any restaurant). The food was incredible. We insisted that we were only having a few light bites but could have easily ordered the entire menu. The 'wild ginger and beef neck c'southern style dry pork curry' were both easily some of the best dishes I can remember having, hugely flavourful and just the right amount of spice. The wine was decent, the prices fair and we were left with a new firm favourite! Finally got round to visiting Kiln after hearing the rave reviews. Cosy and cool environment, we hadn't booked but only waited about half an hour for a table whilst being taken through their interesting selection of orange wines by a very friendly barman. We settled on a Slovenian skin-contact wine which was delicious and different. The food was visually impressive and had bags of flavour, whole-heartedly recommend the brown crab glass noodles which were really special. I would definitely visit again and have already recommended Kiln. 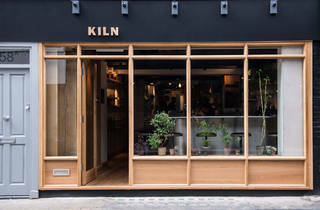 Kiln is a sister restaurant of Smoking Goat another Thai establishment that seems to be sweeping London. 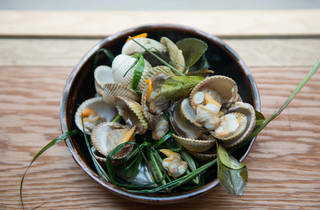 In their own words, Kiln focuses on Thai grill, seafood and clay pots; so I was very eager to see and taste what they’ve created. Thai food is unapologetically intense and invigorating, it’s about flavour, heat, and lots of hustle and bustle; however, I felt that a lot of dishes lacked the visceral nature of Thai food, charcoal and clay pots. The lamb skewers and smoked sausage were tasty but lacked that charcoal flavour. 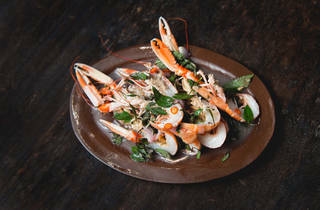 The langoustines were done ceviche-style in their shells but lacked any real punch. I was extremely looking forward to the crab clay pot noodles as there’s a similar Chinese dish which I love; but disappointingly, there was little to no crab or pork meat let alone crab flavour in the noodles. The curried monkfish and the pork neck were better - the monkfish was lovely, if small in portion size; and the pork neck was succulent. 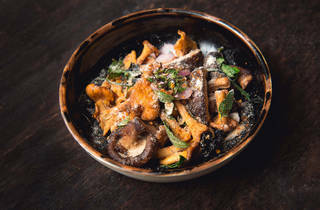 My companions actually enjoyed the mushroom salad with bitter herbs the most as it was punchy, meaty and flavoursome. If you cook with charcoal and clay pots; the flavour is unmistakable. You smell it when you walk in and there is this visceral flavour and fog that leaves you with a very satisfied feeling that only carcinogens and heat can do. 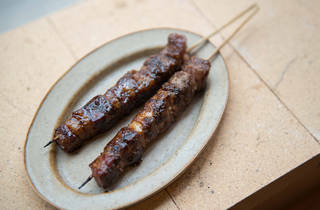 If you’ve tried yakitori in Omoide Yokocho (literally “Memory Lane”) or “Piss Alley” in Shinjuku, Japan; or the clay pot “煲仔” dishes in Hong Kong and Asia; you’ll totally understand what I’m talking about. Unfortunately Kiln fell well short of this; however I am willing to give it another go and try more of their menu; and hopefully, they’ll turn up the heat. Tip: the seating is tight and on stools so it’s more of a canteen style of dining rather than a long sit down meal. Pass on the cocktails and go for the wine instead. WOW - Sunday lunch perfection, I thoroughly enjoy eating up at the bar in restaurants, the simplistic stainless steel giant that is the bar at Kiln does not disappoint. Great for a casual Sunday late lunch, we lucked out with no queue and a seat in the window. The turmeric spiced Gin and Tonic is a must, as is the Hake. They also have several incredibly decent Rieslings on offer. Absolutely delicious. My Monday night dinner dates are always something I look forward too. 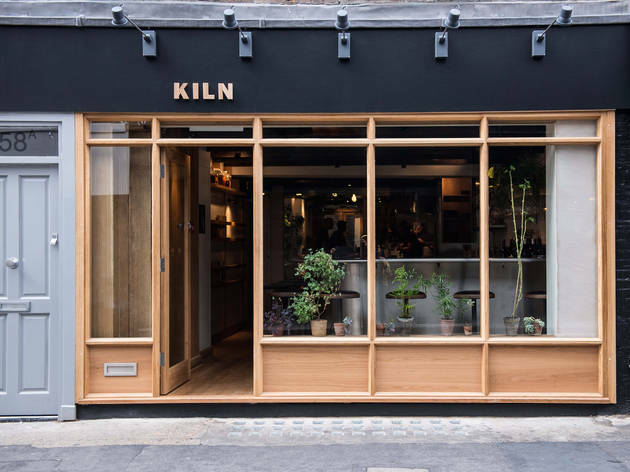 And mainly as I try and go to the places that I have on my hit list of London’s newest spots.Kiln has been on my list forever and I finally managed to make it here without having to queue for a ridicules amount of time. A no reservation and walk in after work 6pm with a 30 min estimate wait wasn’t too bad in my option. All of the food was absolutely amazing and extremely flavorsome. I think the starters were most definitely my favorite especially the Monk Fish that is served on a edible leaf. Staffs are really attentive and full of great recommendations. Lovely place with great atmosphere now I know what all the fuss was actually about. Very disappointing. There wasn't a dish that would bring me back and wait in line for it. The wait would have been okay if they had a decent drinks list but we tried 4 different glasses of wine and each one we would rate from bad to terrible. We had a lovely dinner here in the first month of their opening - the glass noodles and the Burmese curries we would definitely be going back for. We went at an odd hour on the weekend so we didn't have any trouble getting seated. The only problem is we have a direct view to the open kitchen where the meat is being prepared - and the cook doesn't wash his hands between handling raw and ready to serve meats. This seemed like a sanitary issue but hopefully has been addressed since then! This little place with seats around a bar and limited menu was a revelation of my bank holiday Monday. Inspired by southern Thailand, the food was nothing like the Thai dishes I’ve tried so far. Chose seat opposite the kitchen and you can admire the chefs at work. Everything seems to be made in a very traditional way. 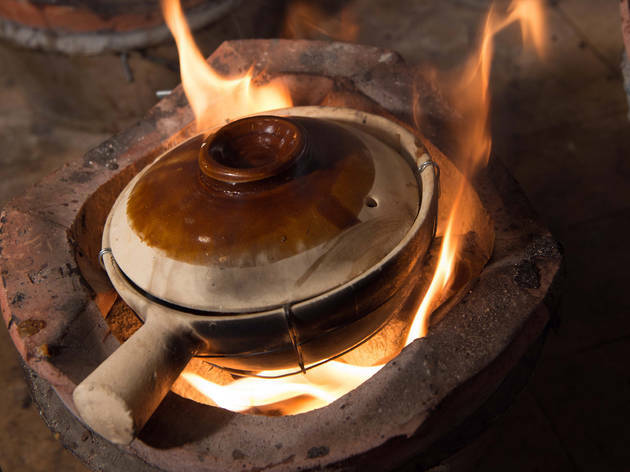 Little kilns instead of modern cooker, pestle and mortar instead of a blitzer or blender. You may think it slows down the serving, but actually they seem to be very well synchronised and with the menu having only a handful of dishes, you can be sure you won’t wait ages for your food. I’ve tried the pollock curry, which was not too spicy and very aromatic, but if you look for a typical thick curry, you may be disappointed. It’s more like a soup with only one veg accompanying the fish. I suggest ordering rice with that. The hot sweet and sour mushroom salad with lemon grass and basil was delicious too. If that wasn't enough, they have very good wines on the menu. If you come in a group, there are a few hidden tables downstairs, but the seating upstairs are my more pleasant and fun. We decided to order two starters while waiting, as we were feeling peckish. Between the three of us, we had the Slow Grilled Chicken & Soy and the Smoked Sausage with Tumeric. Both tasted amazing and I really liked that I could taste and smell the hot fire smell from the grill on both these dishes. The Chicken was kept simply with a soy glaze and a crispy skin while the Sausage was cut into thick chunks, which gave it a nice bite and served with freshly cut red chilies and Thai basil leaves. These really gave the sausage a kick of heat to spice it up! Sour Yellow Curry of Red Mullet - I liked that the pieces of fish were bite-size so it was easy to share among friends and the curry gravy was quite viscous. It had a nice sour and spicy flavour, which I found quite unique. Langoustines, Kaffir Lime & Sweet Mint - This was quite an interesting dish because I don't think I've ever had langoustines before. It has a similar taste to prawns but has a much softer texture and they're much smaller in size. 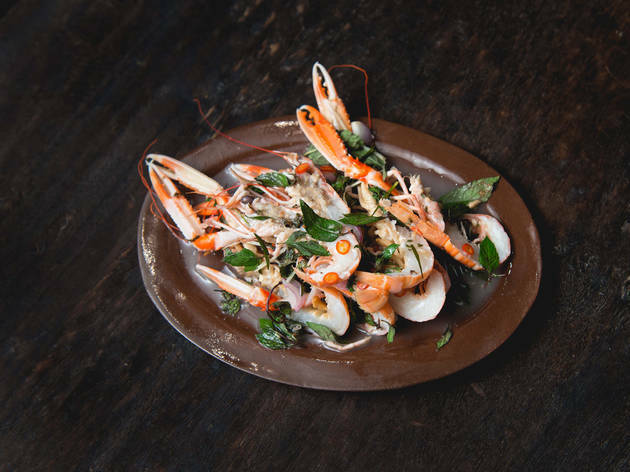 The combination with the kaffir lime leaves, mint leaves and fresh red chilies really gave the dish a freshness that reminds me of Thai seafood! Wild Ginger & Short Rib Curry from Burma - My favourite curry of the night! This was honestly the most flavourful beef curry I've had. I loved the addition of wild ginger slices because it gave the curry a good crunch. The thickness of the curry reminded me of a 'rendang' (Malaysian/Indonesian curry) and went brilliantly with the Brown Jasmine Rice we ordered. Clay Pot Baked Glass Noodles with Tamworth Belly & Brown Crab Meat - We ordered the larger pot that actually feeds four people, but it is so SO worth it. It doesn't fill you up too much because glass noodles are quite light. I loved how the pork slices were blackened and crunchy, as they were lined at the bottom of the clay pot when cooking. This really made the dish very flavourful along with the other vegetables included and the sauce they provide on the side. Stir Fried Cornish Greens & Soy - A pretty simply side dish of Asian vegetables flavoured with some soy sauce. It was good but nothing to rave about, even though the vegetables used were unique. Isaan Style Mushroom Salad - I preferred this vegetable side dish because there were various types of mushroom used in this dish and it flavoured simply but still managed to convey the Asian flavours. 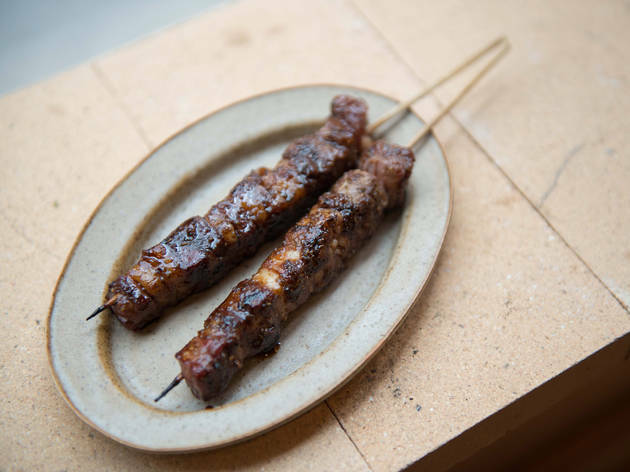 Grilled Tamworth - This resembled barbecued Chinese pork belly with a sweet and sour chili marinade. I adored how crispy the pork skin was and the pork meat was super tender! Mussels - Another pretty simple dish, so it wasn't a highlight in my opinion. It had a slightly sour and sweet flavour but nothing particularly special to stand out compared to all the other dishes we had. I cannot reiterate how delicious this meal was! I will definitely be coming back again soon because of how fresh and delicious the dishes were. I like that they also source their ingredients locally and that there is a daily supply that arrives each day. This also makes it interesting to come back every now and again to see how different cuts of meat or types of shellfish will change each dish they present on their menu. Do not recommend this restaurant. Being a huge fan of Smoking Goat, I thought I would try this new restaurant after the buzz it was receiving. Unfortunately, it disappointed on every single level. The only group tables are in a dank, very cramped cave, the wait staff are quite rude & treat everyone as a "bums on table" operation & most importantly, the food was not very nice. As in this article, the noodle pork dish was not pleasant at all, the skewers are tiny & the curries are watery. Would not go back & would not recommend. This restaurant , opened right across from the gym I go to, had been teasing me staring at me since they opened. I was a little intimidated by the queues I saw outside; but one day we finally decided to try our chance and got seats 45 minutes after leaving our name. Unless you are a big group with a reservation, you are seated at the bar watching chefs work. We ordered the cumin lamb, the chicken, the sausage, the dry fish curry and the rice and vegetables sides. The chicken was tender and juicy with great seasoning, the lamb skewers were delicious. I found the rice a little bland but it helped take the heat of the meat dishes. One thing I can recommend is beware of the sausage starter if you are not good with heat. That was one of the spiciest dishes I have ever tasted and definitely not for everyone.. I heard this was one of the top new places to visit, so wanted to check this out with my girl friends. We got there super early, to avoid the queues and I got seated at the counter, we asked for a table downstairs, so that we could actually see each other and not sit side by side, but they said it was fully booked, even though it was only 5pm and no other guests came in and got sat down when we left at 6.30pm. We were told this was like a Thai tapas place and great for sharing things and we were recommended 2-3 dishes each. The starter on the lamb skewer was divine, but there was only one portion for £2.90. Which was a lot for one tiny skewer, but the meat was tender. The mains of lamb and pork dishes were extremely chilli, we are all of Asian origin and it was too hot even for us, unfortunately the next day we all got bum burn. None of us asked for any extra spice, this was just the normal spice level on the menu, we were shocked as it was way too spicy. Don't think any of us will be going back in a hurry!